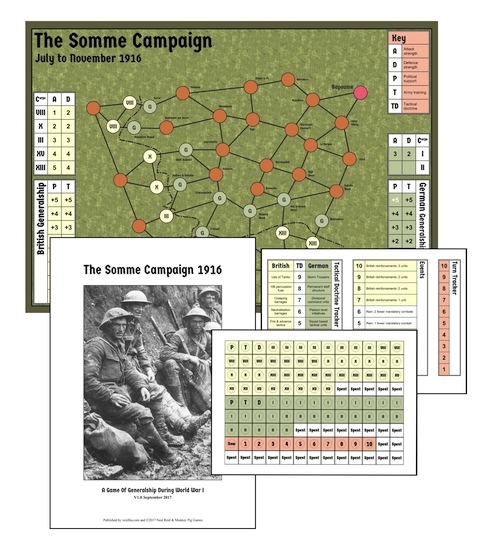 The Somme Campaign – what is the game about? 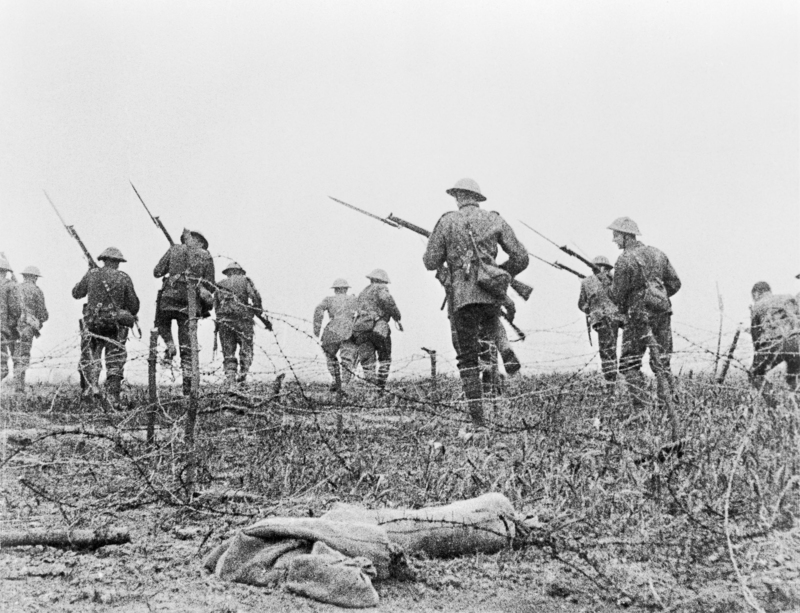 Still from the film “Battle of the Somme”: British troops go forward in ‘No Man’s Land’. The Somme : What happened after the 1st July 1916? Historically Haig launched the Somme under some political and military duress. The French were fighting, and the perception was they were losing the Verdun battle and needed the British to divert German resources. Initially Haig was to open the offensive with some 30+ French divisions, to fight alongside his by then well-trained and equipped New Army divisions. The reality was he had to start with only a minimum of French divisions, and he had real reservations about the training of his own divisions. He set surprisingly broad, far-ranging objectives for Rawlinson’s 4th Army, and the corps commanders. These men made detailed plans as to how these objectives were to be achieved (for example read VIII Corps plan free from the British Library digital archive link ). However, he was initially stymied by two things – he couldn’t choose his command team (The VIII Corp commander Hunter-Weston (proved to be a dogmatic, inflexible man unconcerned for casualties at Gallipoli) had connections at court and was thus untouchable) and he didn’t actually have the technological means to achieve what he wanted. Haig wanted his divisions to break through the German lines, and exploit operationally into the rear of the Germans, thereby breaking their army apart and opening the front up operationally. We would understand what he wanted to achieve by looking at WW2 campaigns. But his army could barely communicate between its constituent parts, his artillery needed weeks to physically move forward and be ready to bombard again and his simple command and control tactics led to too many casualties to make an offensive sustainable in the long-term. By the end of the Somme, both sides had learnt many lessons and taken on board many changes. It’s interesting to read the history of 3rd Ypres in the following year to realise how much the Somme had an effect. The primacy of the Division as the battle unit, the switch to making the platoon on the battlefield the primary combat unit and the need to set up permanent higher command structures to ‘battle manage’ the divisions continually rotating through it. The life expectancy of a division in combat was about 2 weeks, therefore permanent staff structures, artillery units and logistic supports were set up separately which the divisions then rotated within. This gave a consistency to the front line and enabled better use of the Division man power. The Germans through political pressure changed their higher command, abandoned the fixed defence and automatic counterattack tactics and developed flexible deep defence, as well as similar changes detailed above. These new ideas came about during, after, but importantly because of the Somme and came to successful fruition in the final advance of 1918. I want to put the players into the position of the higher commanders, where political issues needed to be balanced as much as the logistical and training needs of the men themselves. I also wanted to reflect the huge turnover of units, to give the player an idea of ‘battle managing’ the campaign. It is of course important to remember, and reflect on, that each spent division means a huge number of new widows and grieving parents. The game I have developed, as it stands I hope represents some of these issues. The games own combat calculation requires a clear 4 point difference to win, this reflects the tactic of lining troops up and flinging them towards an enemy in trenches with machine guns. You may get very lucky and win, chances are you won’t. VIII Corps on the 1st July proved this point. In the game, you could, quite cynically, just attack all along the line knowing that whatever the result the units are spent, and your enemies precious Generalship points have to be used to reset them, and therefore not on anything else. You could, again perhaps quite cynically, call this a deliberate tactic, a ‘War of Attrition’ if you like, and your enemy is bound to be overcome in the end…..isn’t he? You could however start to develop ways around having to send lines of troops against machine guns, and develop further Tactical Doctrines. These add to your combat calculation and begin to negate the 4 point penalty. You could then spend Generalship points on training and reinforcing the Corps, and then smartly breaking through the enemy to your objective. Like Haig, like Ludendorf, you can make these choices. As the Germans you are looking to keep as much of France as possible whilst reducing your casualties. This isn’t your offensive, so denying the British their objectives, and even maintaining yourself on your frontline can be considered a great victory. Remember the War of Attrition can work both ways. But just think of the political fallout if you actually took some of the British lines! In the game every unit in combat becomes spent, effectively useless as a combat unit. The player is forced to make the decision to reset the unit, or lose the unit. This costs Generalship points and reflects the way Generals had to ‘battle manage’ the campaign forces. It’s this process that drives the strategy of the players. Congrats. Verdun and the Somme were hell on earth to be sure.